In contrast to the urban-oriented, eastern side of the expanded Walker Art Center, the western side of the facility will be banked by a new park, balancing the animation of Hennepin Avenue with contemplative green space. Designed for public gatherings, the display of sculptures, and the enjoyment of nature, the park will add four acres of greenspace between uptown and downtown Minneapolis. 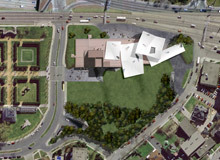 The site's design will connect to that of the much-visited Minneapolis Sculpture Garden. In addition to the four-acre park, additional key outdoor elements of the expansion include a plaza along Hennepin Avenue and rooftop terraces with spectacular urban and park views. The designer selected for the park is Michel Desvigne, recipient of the Medal of the French Academy of Architecture (2000). Desvigne has taught at Harvard University's Graduate School of Design and has worked with such leading architects as Rem Koolhaas (O.M.A. ), Jean Nouvel, I. M. Pei, Renzo Piano, and Richard Rogers. This is his first project in the United States. Desvigne's international landscape projects include the Millennium Park in London's Greenwich Peninsula; the Port Marianne area in Montpellier; and the Jardin James Joyce in Paris' Seine-Rive Gauche area; TGV Méditerranée railway stations in Southern France (Valence, Avignon, and Marseilles); the Sieroterapico Park in Milan; a public square near Amsterdam; and large parks surrounding the Centraal Museum of Utrecht, the Middelheim Museum in Antwerp, and the Fort Thungen Museum of Modern Art in Kirchberg, Luxembourg. "The expanded building will be lighter, airier, more open and inviting than the current minimalist brick cube. Its high-tech fabric 'skin,' multiple entrances and informal gathering spots are refreshing. The designers and staff also seem to be working overtime to embrace nature and soften the sometimes hard-edged geometry of the adjacent Minneapolis Sculpture Garden."